How can contemplative practices and rigorous scientific studies best inform each other for a greater common good? Internationally recognized scholars and contemplatives will explore this issue in what promises to be a thought-provoking, multi-disciplinary conference. 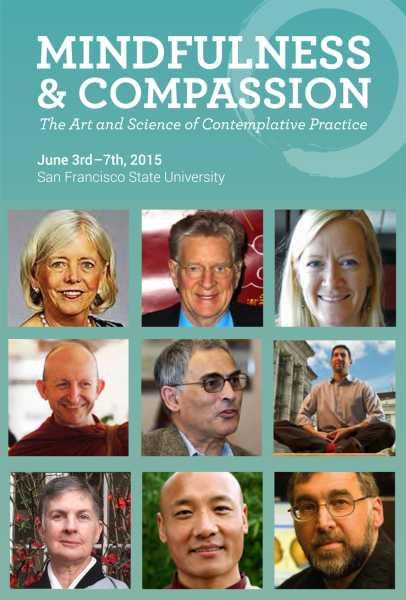 Please join us for this special event, Mindfulness and Compassion: The Art and Science of Contemplative Practice, June 3-7 at San Francisco State University (SFSU). Among the distinguished faculty is Central Abbess Eijun Linda Cutts. San Francisco Zen Center is pleased to partner with the Institute for Buddhist Studies, the Mangalam Research Center for Buddhist Languages, Meridian University, Springer Publishing, and the California Institute of Integral Studies to present this conference convened by the Consciousness, Mindfulness and Compassion (CMC) International Association and SFSU. Early registration discount until February 15, 2015.